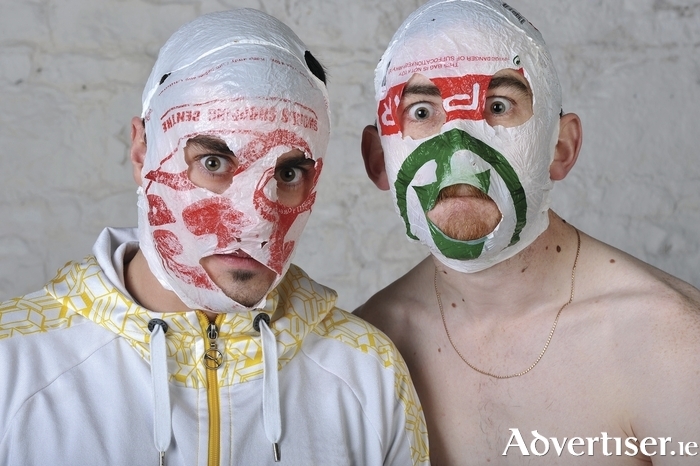 The Rubberbandits. Photo:- Steve Ullathorne. THE RUBBERBANDITS, the satirical hip hop duo of Blindboy Boat Club and Mr Chrome, who had dominated Irish comedy through their shows, hit songs like ‘Horse Outside’, radio appearances, and videos going viral, seemed to go very quiet, very suddenly, over the last year and a half. There was no risk, however, of the Limerick duo having binned their plastic bag headgear, rather, they continued to record new songs and videos, but were concentrating the majority of their efforts on bringing The Rubberbandits’ message to Britain. “Ya, it all got a bit mad here after the ‘Horse Outside’ nonsense, so we f****d off over to the UK to start afresh,” says Blind Boy. It proved a shrewd move. The Limerickmen delivered a new show, Continental Fistfight, and found their idiosyncratic, highly original, comedy, meeting with rapturous acclaim from the British public and critics. The Guardian praised their “dissenting and provocative humour,” calling it “wild and winning”; while Metro said their “funny, catchy songs” made for “an exhilarating night out”. A mark of how well received The Rubberbandits were, came last May, when, by special request of Dominic Dromgoole, artistic director of Shakespeare’s Globe, Continental Fistfight became the first comedy show to play the Globe’s new Sam Wanamaker Playhouse. How did the request come about? With Britain well and truly impressed, The Rubberbandits are now bringing Continental Fistfight to their native soil. Their first three shows at Dublin’s Abbey Theatre sold out in 24 hours, and an extra date was added, and the shows in Galway, Limerick, Cork, and Kilkenny, are likely to do the same. Continental Fistfight will have “loads of jumping up and down and shouting”, according to Blindboy, as well as a celebrity puppet, who, we understand will be “Paul Newman, the dead actor who made all those charity sauces”. But what is the inspiration behind the name of the show? “We’re not really unimpressed by hipsterism in general, just a particular type of gowlbag who happens to be a hipster,” says Blindboy. “I think the hipster as a whole is the 21st century teenager. The teenager didn’t actually exist until the 1950s. Before that, you went from child to adult, with no in-between. The teenager essentially was a delaying of adulthood by about eight years due to the post-WWII economic boom and a massive emerging middle class, whereas the contemporary hipster is a delaying of adulthood brought about by global recession. “The hipster usually goes to college, and finds by the time they graduate that they are overqualified for the available jobs. So they delay settling down into adulthood - ie, mortgage, marriage, career - by either pursuing further education, or work in a coffee shop and live off their parents’ money until the right job comes along. A product of the age of entitlement. Another of the duo’s more recent songs, which has gained attention is ‘Spastic Hawk’. What were the inspirations behind the song and, given its provocative title, have the Rubberbandits encountered many people who misinterpret it? For a duo that has at times found itself in the middle of controversy, they have always been more than able to take on their critics, through their intelligence, wit, and articulateness (the now legendary Liveline interview in 2010 ). Yet, despite their command of argument, ideas about ‘the power of the spoken word; is not something they would over emphasise. Also interesting, given the occasional controversy, were the press releases for Continental Fistfight headlined ‘Respectable at last!’ so do The Rubberbandits feel ‘respectable’ and part of the establishment these days?